22-Feb-2005 -- About 16 hours to go to Ceuta in Spanish Morocco, where we will get fuel, and this afternoon we are due to bag the last unvisited Algerian offshore, 36N 1W. This is a very interesting Confluence, from which much can be seen, especially on a day with such a splendid visibility. We start to look towards ESE. There we see the eastern coastline of the Gulf of Oran with Cap de l'Aiguille (Needle Cape) and Kef (Cape) el-Menzah with the mountains of Djebel Kristel and Djebel Kahar, both about 500-600 m high. 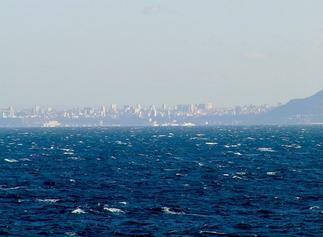 Looking to SE, we see the town of Oran (Wahrān), situated on the head of the Gulf. On the right side there is Djebel (Mount) Santon, partly obstructing the city. Oran is the second most important city in Algeria and a major commercial harbour for handling most types of cargo, including petroleum products, coal and grain, containers and Ro-Ro traffic (Roll-on/Roll-off, i.e. cars, trucks and trailers). The population is about 700,000. Looking further to SSE there is the densely populated coast around Cap Falcon. Almost in the South there is a very tiny island, Île Plane ("Flat Island"), on which a prominent lighthouse stands. Finally, we have a look to SSW. There we see Cap Lindles and Cap Sigale, and a small group of islets, Îles Habibas. Such small archipelagos should always attract our highest attention, especially when they are named after a "Darling". So far as I know with my rudimentary Arabic, "ḥabīb" means "dear" and "ḥabībī (m)/ḥabībatī (f)" means "My Darling". Well, then let's have a closer look to Îles Habibas: They are indeed beautiful! They consist of two islands and numerous islets and rocks and are fringed with reefs and rocks. What might be going on there? Probably not much, but at least more than nothing. They have a very nice lighthouse.